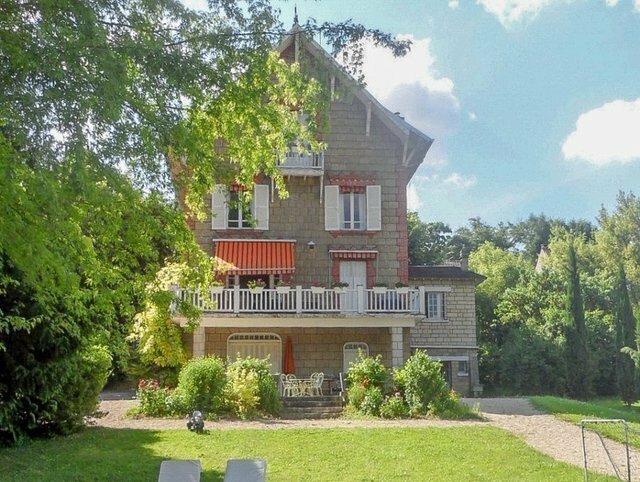 Property for sale in France next to Paris, located in the upper side of Ouest Paris area. Proximity of Saint Germain, Andresy 78570. Authentic XIXth century property overlooking the Seine river, with its house, 320 sqm (3444 sqft) surrounded by its garden 3.600 sqm (38750 sqft) closed and razed with beautiful fruit trees. An additional 100 sqm basement and 60 sqm dependency currently used as storage area and a garage with independant and direct access to the road. Entrance, living room, dining room, independent kitchen and double living room with a south facing terrace overlooking the garden and the banks of the Seine. 6 bedrooms ranging in size from 15 to 30 sqm. 4 on the first floor; parental suite and guest bedroom on the 2nd floor. On the basement and with direct access on the garden, a large play room with covered terrace, shed, service room and wine cellar. Ideally located, 20’ drive to the International High School of Saint Germain and Maisons Laffitte, 25’ to the business center of La Défense and 35’ to the Paris city center (with easy access by motorways: A13, A14 and A15 ). A 5’ walk to the train station will allow you to reach by train St Lazare in 25 min and Porte Maillot in 25 min with the RER A connection. Make yours, this ideal family house by the Seine river. A rare and unique, peaceful and quiet property.